A new version of the Tesla Model S has driven to the highest score ever recorded by the engineers at Consumer Reports. 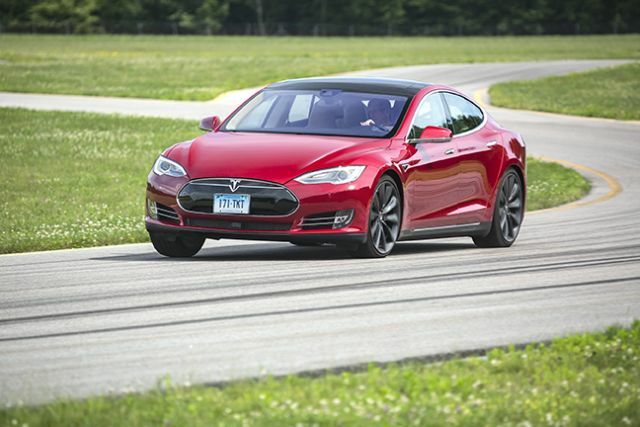 The $127,820 all-wheel-drive P85D totaled 103 on a scale designed to max out at 100. After reconfiguring its scoring slightly, CR rewarded the blazing acceleration and top fuel economy of the P85D. The original Model S earned a 99-point score from the magazine in 2013. Before that, the highest score had been a 96 for the Mercedes-Benz S-550. Superlatives abounded from the often-skeptical CR test drivers. The P85D is the quickest car they ever tested, going from zero to 60 MPH in a mind-boggling 3.5 seconds. And it still delivers the electric car equivalent of 87 MPG, topping the 84 for the original Model S. "The Tesla is a shining example of how higher fuel economy standards can be achieved without sacrificing performance," says Jake Fisher, director of automotive testing at Consumer Reports. The P85D also has shown promise on the weakest point of electric cars -- range before having to recharge. Two test drivers took the P85D across Denmark, a total of 452.8 miles on one charge. The official company rating of the range for one charge is 285 miles when driving a steady 65 MPH.